Centre 404 Quiz Night 2017! 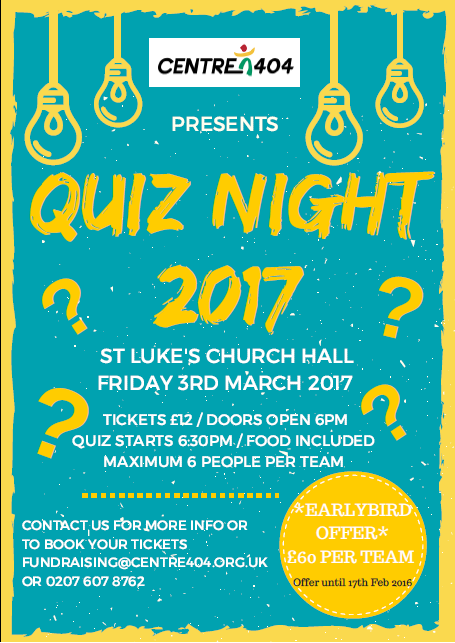 Our annual Centre 404 quiz night is back and is taking place on Friday 3rd March from 6pm at St Luke’s Church. Familiar Centre 404 faces Bob and Derek will be compering the night whilst testing your knowledge alongside a delicious meal of curry, rice and naan bread. There will be a raffle with some fantastic prices as well as our famous jewellery stall and a bar. Tickets are only £12 and include a delicious curry meal. We only have a handful of tickets left so get in touch to purchase them soon to avoid missing out! Email us at fundraising@centre404.org.uk or call 0207 607 8762 for more information or to purchase your tickets. Alternatively you can book online here.